They helped her concretize, see it, feel it; they were great. With a little creative thinking on my part, these little froggies have illustrated so many things – grouping for addition, arrays for multiplication, sorting by various criteria, patterns, weights, measures, division, and waaaaay more. But with Gavriel Zev, it turns out, not so much. What he sees when he sees the math frogs are the “math FROGS!!! !” With many insane exclamation marks on the end, because who wouldn’t go nuts when confronted with the sheer madness of about a million shiny colourful plastic frogs? Oh, yeah, and who cares about the math? Sure, he’ll put up with them for a minute or two, so I can regroup the same seven frogs into five-and-two or six-and-one. But only if spiderman gets to watch, and only if I am well aware that the frogs themselves are just itching to bounce around having their wacky adventures together. ‘Twas always thus; one time early on, desperate to find something to amuse him (dunno why, in a house with a million toys), I sharpied eyes onto a few clothespins and handed them to him. He played with them for a long time. This is a boy who is never alone: anything with eyes is an instant companion, and in a pinch, he will imagine eyes that aren’t even there. And even if a math “toy” has no eyes, like our Cuisenaire Rods, it can become something else in the ever-expanding Universe of Fun that is Life According to Gavriel Zev: a building block, a wall, a car, an obstacle, an enemy. Which is also why, often, what worked for Naomi Rivka does not work for Gavriel Zev. Manipulatives that draw his eyes away from the page and call out “playtime!! !” are more of a hindrance than a help. And as much as worksheets may seem like a more dry way of doing math, he really seems to “get” them. 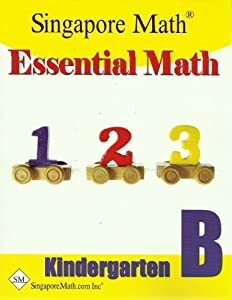 We recently finished the Mathematical Reasoning book he loved so much, and I decided to plunk him right into grade level with Singapore (Essential Math, Kindergarten B), since it’s working out so well for Naomi Rivka (she’s in Primary Mathematics 2B). We actually completed the second page shown here, Unit 20, Number Bonds, today and it’s so fun to watch him gradually absorbing the concept of parts and wholes, which is so central to a lot of what happens in Singapore once you hit the grades. 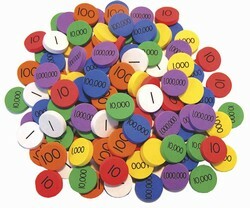 Singapore purposely doesn’t rely on manipulatives, by the way; though they use some basic place value disks later on, even these are purposely kept bland and similar-looking so they won’t become a distraction from the necessary abstraction that is required for kids to think mathematically. The program revolves around the quick progression from concrete to pictorial to abstract. Not gradual over months, but immediate progression, like right away, within the same lesson. Kids are shown something concretely to begin with, but then work out the same problem right away looking at a picture of an object or manipulative. Finally, they are shown it as represented by numbers and symbols, the universal language of mathematics. Which helps to explain the blandness of the “Number Bonds” worksheet above. The kids group circles and count them – not ants or corn on the cob or fish. By the way, the book hasn’t introduced the “+” symbol for addition yet, or the “=” sign; as with Miquon (but infinitely more abstract!) it begins with observing the relationships among numbers and progresses from there into the formalization of those relationships. Despite all of which, there will always be a warm place in my heart for the math frogs. Though perhaps not in Spiderman’s heart; after I took this picture, the frogs won the battle and pulled him all the way under. He totally drowned in frogs – it was awesome; you ought to have been there. And I learned a thing or two along the way in what makes each kid unique and special and challenging, and marvelled again at the absurdity of herding 30 of them into a classroom and expecting to teach them all the same stuff at the same time. Well, hopefully they won’t pull out manipulatives of any kind if my kid is in the vicinity. How about your kids? Do manipulatives work for them??? Haven’t done one of these in a good while, but at least I have come up with a catchy name for them: Parsha Skills Worksheets (click to see previous worksheets). If student is very comfortable with the vocabulary, dictate the copywork verse to him/her. Read it aloud twice first, very slowly. Then, let the student write (on a lined page) as much as he/she remembers. Praise the student for effort, not exact duplication of the passuk. By the way, I present these pages in the order of “get ready” (introducing words / grammar), “get set” (fun activities), then “go!” (reading the actual passuk). With a child who’s more confident, you may wish to start with the “go!” section, then read “get ready” together and leave him/her to work independently on “get set” on his/her own. 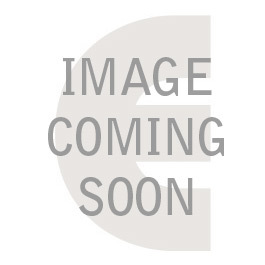 For General Studies printables, including science, art and music resources in Hebrew and English, Ambleside, composer and artist resources, click here. First of all, one of my biggest happy impressions – as always, when speaking to homeschoolers in the US – was, thank goodness I live in Canada! While other people talk about curriculum and reporting and consulting and government interference and accountability, I basically sit back and close my eyes and wait for all that boring stuff to be over. In case you are in the U.S., let me explain what we had to do, in terms of accountability and paperwork, when we decided to homeschool our two youngest children: we decided to homeschool them. Period. The law here is a bit blurry and opinions are divided on whether it’s necessary to file a Notice of Intent to Homeschool if your kids have never been in school. Anyway, we never have, for the younger kids (both older kids have been officially “homeschooled” at one time or another, as this is required to take certain Ministry-funded high school correspondence courses). But that’s not really a conference thing, just me walking through the crowd feeling like a bit of an alien during certain parts of the discussions. What I really want to talk about are the sessions I attended. As always when there are sessions, you have to choose and there is always going to be one choice you don’t get to go to. Here are the sessions I attended with a one-line summary of each. Keep in mind that, since Naomi Rivka refused to go to the childcare, she was sitting next to me for each one. That made me a bit uncomfortable, mostly worrying that SHE was going to be uncomfortable, but also – a little bit – worrying that she’d hear phrases like “Mommy Meltdown” or “caring and patience” and have some kind of “aha” moment where she’d realize that any bad days we might experience around here were actually kind of unacceptable. While a mishna in Pirkei Avos is usually given as the rationale for rushing kids into learning Mishna and Gemara at specific ages says, “ben chamesh l’mikra, ben eser l’mishna… ben chamesh esrei l’gemara,” the intention of the mishna itself is not what most people think. It’s usually translated as “five years old to read chumash, 10 years old to learn mishna, 15 years old to learn gemara.” But Pirkei Avos was written hundreds of years before the mishna, let alone the gemara, were written down as we know them today. So these three stages must (he said) refer to those types of learning skills, not the actual books themselves (since they didn’t exist yet). In my opinion, these skill levels correspond very well to the three stages of the trivium as taught in Classical education, but that was my own brain interjecting thoughts, not something he actually said. Unfortunately, he was under the impression that he had a whole extra half-hour to speak, so he didn’t get to show some of the practicalities of his program. Skipped a session on record keeping (see above, I’m Canadian!) to attend this one. And yay, a speaker actually talking about subjects other than kodesh! She talked about how to use a relaxed, holistic, kind of unschooly approach to incorporate learning into many areas of our kids’ lives. I found myself nodding and nodding and nodding – feeling almost like the congregation in a black gospel church - “Amen, Sistah!” She spent most of her talk introducing her new conversational Hebrew program, Holistic Hebrew, which I mentioned briefly in my earlier post. We were supposed to have a chance to try it out among ourselves, but unfortunately, ran out of time. I took the materials home and would like to try it with the kids. Missed “Hash It Out - A Moderated Shmooze” and “Homeschooling in Maryland: Laws and Other Guidance“ to go hear Rabbi Horowitz; as I told a friend at the conference, I’d go to hear him read the phone book. Whatever he’s saying, it’s going to be good, and this session didn’t disappoint. He talked about his methodology for teaching Chumash, but more importantly, talked about the importance of teaching it systematically, in a way that makes sense. Many schools don’t do this because it’s easier and quicker just to get started. But laying the groundwork through rigourous training in roots and prefixes / suffixes will help kids feel like Chumash learning is within their grasp… which can have tremendous payoff later on down the line where they are more likely to feel at home in Torah learning. He also introduced the new second volume in the Bright Beginnings Chumash workbook series, which I bought from his wife during the lunch break. Unfortunately, his session was only half an hour and was hampered by a few technical difficulties. The truth is, I also spent a lot of time during lunch standing around plugging my book, giving out business cards and otherwise trying to sell myself. It was kind of fun and gave me the focus and questions I needed to put together a basic FAQ for the book. That said, maybe they weren’t displayed as well, but fewer people seemed interested in the lapbooks, which was sad to me, because they are such a fun way to get a lot of real learning done. Here’s my stuff, all laid out – okay, kind of slapdash! This and the picture at the top were literally the ONLY two pictures of any kind that I took during the conference. I wanted to HAVE the experience, not waste time running around taking pictures of it. This was another easy call: I skipped a session called, “A Father's Perspective.” Indeed, there was only one Abba in the room for this session, who said he was there to learn to support his homeschooling wife better. Aww… Robin’s message was basically, “family first.” Reinforced by anecdotes from her own 6-week road trip, alone with kids, something I’d never be brave enough to do. Her talk was very practical, with lots of tips and hints from her own experience. Skipped Unschooling Kodesh: an Oxymoron? with homeschoolchumash’s Jessie Fischbein. I’m sure it would have been fascinating. You may have heard of Classical Education in the general homeschooling world: early study of Latin, diagramming sentences, mummifying chickens(!). How can we apply the principles and motivations behind this seemingly non-Jewish educational philosophy to limudei kodesh? Missed “Teaching to Our Children: A Look at Individualized Education,” which I probably would have gotten more out of. By this point in the day, I’ll be honest, I was getting a bit tired and overwhelmed and overloaded. Not that I was unhappy – you totally get your money’s worth out of this conference, especially since the cost of admission was only $36. This was the one session I probably could have done without. It was sort of focused on child development, but not at all focused on homeschooling, and really, having raised 4 kids, I feel like this is the kind of stuff I know already, and know specifically about my own kids, better than I could be told by somebody who isn’t a homeschooling parent and mainly seems to have experience with special-ed kids in schools. I have nothing against the presenter, but did not enjoy this talk for those reasons. Oh, well… they can’t all be a win. 5:15 - Homeschooling Parent Panel: Let's Learn! Yes! Something fun! Learning from the pros! Except, by this point, I was not only exhausted but also worried about making it to our 9:15 bus, given that we needed to stop for supper along the way. Naomi Rivka, on the other hand, even after seven or eight fairly dry (for an 8-year-old) speaker talks, was absolutely riveted. Throughout the weekend, she’d become utterly fixated – to the point of Creepy Stalker Obsession – with one of the homeschool mamas who happened to be participating on the panel. And she was basically staring, staring, staring at this mama while the panel discussion was going on. She would have sat there all night listening to this woman speak. All week. All her life, just for the opportunity to be taken home by this woman. She was IN LOVE. So when I went off to the side to pack up my bags, she refused to come with me, but stayed in her seat front and centre, perched there in her stock-straight, bolt-upright fashion, staring zombie-style at this one particular mama. At which point I realized that, despite having unloaded a few books and a couple of maple syrup bottles, my suitcase was now officially MORE FULL than it was on the way down. This is a mysterious thing that happens when I travel; my possessions swell to fit the available space, then swell more when we arrive until they are absolutely un-repackable for the way home. Desperate, I crammed everything in, but even with forcing and squishing, could NOT get the suitcase to zip all the way. Gave up, grabbed Naomi Rivka, and left. Saw a woman from the conference outside the JCC and dashed outside to ask her for a ride to the restaurant… only to realize that the JCC was now closed and I had no way of getting back inside to retrieve my suitcase. And then, oops – realized I’d forgotten to say goodbye to a few people of the people there that I really cared about and didn’t want to leave without doing it. But that’s okay, because the woman seemed totally dubious about giving us a ride, anyway. She was like, “well, I’ll have to ask my husband.” But I was prepared to push, because I had a kid with me, so we waited until he came with the car, and it turned out he was happy to give us a lift. I told him to wait literally 2 minutes, found an open door back into the JCC, hugged the person I wanted to hug, waved at a few friendly faces, grabbed our suitcases, and hopped somewhat awkwardly into his car. Our supper (at David Chu’s China Bistro) was wonderful, though I realized halfway through ordering that there was not a single vegetable coming our way… well, except in my Hot & Sour Soup, which was delicious. It’s the only place I feel happy ordering the Hot & Sour Soup, knowing it’s not going to be gluey or sweet or red or weird like other kosher restaurants I’ve been to. Also, after eating lunch at the conference, neither of us was all that hungry, so we ended up taking most of our meals to go. I ate mine (General Tso chicken) on the bus later that evening, but Naomi Rivka never did finish her chicken fingers (a generous plate, with fries, for $6.50). After supper, we rushed to the Metro station which Google Maps had promised was 11 minutes away. It was more like 20, and by the time we got downtown, it was 8:25 and I was worried there wasn’t time to get to the distant mall where the Megabus stops. So we took a cab… fifty bucks later, we made it to the mall with 10 minutes to spare. The bus arrived on time, and we were homeward bound! I haven’t really said anything here – cuz I’ve been holding back – about what a bittersweet experience this conference was; how weird it was exploring my commitment to homeschool and rededicating myself to the cause of educating my children… even as I am planning to turn them over to various schools once we arrive in Israel. But in a sense, we are all homeschoolers, and I never want to abdicate responsibility for the kids’ education, which ultimately does rest on me. So I feel good for having gone. I’m happy I went. Never rains but it pours, and after weeks of neglecting this blog, I have poured my heart out today, trying to capture all my impressions of the homeschool conference before they’re gone. But I do want to stop for a minute and ask readers to consider buying my book, The Family Torah, a project I’ve poured my heart into for the last few months (wrapping up a few years’ work of originally writing these as free parsha summaries each week). What’s the main idea of the book? The Family Torah tells the story of the Torah in plain English in a way that can be easily read aloud. How did you choose what to include? Well, not quite. Going through the Torah parsha by parsha, I tried to include every major component of the narrative, while at the same time cutting things down for brevity where the Torah text is repetitious, or for kid-friendliness when the content is of an adult nature. The Family Torah’s narrative is based mainly in “pshat” – the plain text of the Torah – with a sprinkling of midrash (the traditional stories behind the stories). More on that in a minute. I also tried to include “mashalim,” little metaphors kids in particular could relate to, to help make the ideas behind the parsha more real to them. These also add an element of humour that I hope will make reading it together more fun. Oh, and then I threw in art, because my husband, Teddy (Akiva) MacLeod, is a super-talented artist and created a wonderful parsha cartoon last year from which most of the illustrations were taken. What language is the book in? It’s written in clear, plain English. I have a degree in philosophy (heavy on essays and other writing!) and a background in freelance writing and editing in English. However, some Hebrew words appear in transliterated form where they are helpful to know and / or untranslatable. For instance, I use words like “Mishkan,” “korban” and “kohen” instead of the English “tabernacle,” “sacrifice” and “priest,” partly because these have such different meanings in English. In some cases, to aid in pronunciation, I include bracketed Hebrew text, but it’s not meant to be read aloud. I also included a glossary of all Hebrew words at the back of The Family Torah. How is this book different from The Little Midrash Says, My First Parsha Reader, Morah, Morah, etc? I own lots of those books and love them! But yes, The Family Torah is different. Midrash, in particular, adds a valuable dimension to the text of the Torah. However, while many books draw mainly on midrashic traditions, I wanted this book to be very clearly grounded in the “pshat” of the parsha. I do introduce midrashim where they can clarify the text of the Torah, and every time I do that, I use a phrase like “some people think” or “some people say” to clearly differentiate what is pshat and what is midrash. Also, most kids’ books pick and choose which incidents or narratives from the Torah to include. For the most part, there is nothing major left out in The Family Torah. I believe there is something relevant to every kid in every single parsha of the entire year. What age is it appropriate for? My younger kids are 5 and 8; I wrote it mostly for them. It would probably work to read aloud to kids anywhere between 4 and 10. For younger kids, you can split up the reading into 2-3 sessions a week so they don’t get restless. A parent can read the parsha from The Family Torah and find two or three meaningful elements to share quickly with a younger child. Of course, older kids may be able to just take it and read it themselves, but I really hope this book will be part of an oral storytelling experience; perhaps there are younger children they can read it to as well. Think about it: Torah itself is meant to be read aloud in shul, and mothers have been telling their kids the story of the Torah for millennia. I hope this book will help modern families to carry on this tradition. So much of what our kids learn is based on solo activities (independent reading or worksheets) and so little these days is centred around home and family. Ultimately, I hoped to create a cuddle-up-and-read kind of book that will give kids the happiest memories possible of learning Torah in a warm, happy environment. I really hope I’ve succeeded. Please email me with any more questions or click here to buy the book! Oy, vey! Vendors, Curriculum, Yay! I’ve already posted about everything BUT the conference. Turns out, there is just too much to say to put even the conference stuff into a single post. So I’ll start with what seemed to me the biggest difference from previous years – limudei kodesh vendors and curriculum creators. All the cravings I’ve had in the past years for booths and vendors and people talking up their materials, all my wildest curriculum-crazed dreams, came true - a little bit. Not, probably, in the way they would have if I were Christian attending a Christian homeschool conference, in which case I’d have dozens of programs to choose from for every little subject (Bible-based handwriting, anybody? Faith-based science or history curriculum?). But, as I say, a little. As an outsider, this seems to have been the year in which something tipped and suddenly, people are realizing that frum people are homeschooling (gasp! regardless of occasional silly articles that may appear). Suddenly, even mainstream publications in the frum world are covering it favourably, and suddenly, a few small vendors are willing to speak and appear at the conference. And happily, unlike in the Christian world, where homeschooling is very broadly accepted already, it’s not just about “the more, the merrier”… it’s a matter of the more vendors, the more credibility the homeschooling community will ultimately have. I was most thrilled by the inclusion of Rabbi Yaakov Horowitz, a speaker and educator, and also the creator of the Bright Beginnings chumash workbook which we’ve been using since July of 2011. Not only was he a vendor but he was a surprise last-minute speaker at the conference (though he was only given a half-hour timeslot and could have used twice that amount). He used his timeslot to introduce the system and methodology behind Bright Beginnings and to preview the brand-new Book 2, which continues in Parshas Lech Lecha right where Book 1 left off (I bought it after his talk). As with Book 1, Bright Beginnings Book 2 looks colourful and includes the same assortment of cards etc that we have found in Book 1. 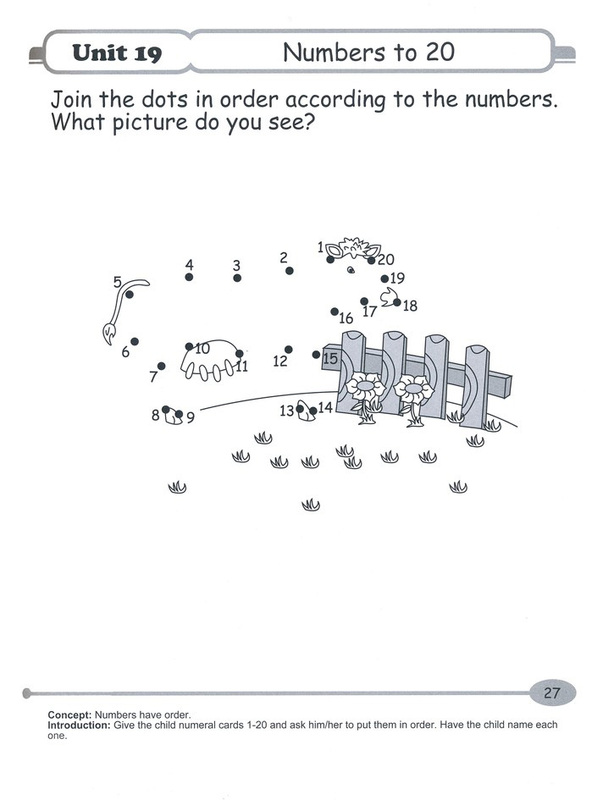 The book has a slightly less “easy” feel, in keeping with the fact that it’s for kids who are a little older. - and, of course, the core of the book, which is roots-based, systematically broken-down, colour-coded Torah text. I have said it before, indeed, shouted it from the rooftops to everybody who would listen, but I’ll say it one more time: Rabbi Horowitz is one of the good guys, saying stuff about education and child safety that we should all listen to. Here are links to Rabbi Horowitz’s website (read it!) and to the Bright Beginnings program in specific. Another great inclusion was Rabbi Dr. Pinchas Hayman, an Israeli curriculum developer who spoke about teaching Torah she b’al peh (usually interpreted to mean Mishna and Gemara; all the Torah given on Har Sinai that wasn’t written down). I wasn’t really interested in this subject at all, for a number of reasons, so I was surprised to find his talk not only riveting but, dare I say it, almost essential knowledge for any parent, homeschooling or otherwise. But, Rabbi Hayman said, this was written hundreds of years before the mishna, let alone the gemara, were written down. So these stages must (he said) refer to those types of learning skills, not the actual books themselves (since they didn’t exist yet). He introduced his program for introducing mishna and gemara gradually, in a 4-stage, skills-based way, and reassured audience members (I know because it was my question!) that an adult need know only basic Hebrew to begin introducing the program. There’s also a program specifically geared towards high schoolers and adults with no background in learning mishna and gemara. As Rabbi Hayman spoke, I began to realize that this is probably the program the older kids used in their first year of mishna at school. I enjoyed what I saw of it back then, which was largely CD-based, and centred around understanding the chain of tradition that gives the mishna its authority. More importantly, it looked like the kids were having fun with it. I don’t have many specific memories, however, because it was a long time ago. Caveat: having looked at some of the materials while I was gathering these samples from his site, I have come to question whether these really are teachable by an adult without a strong Hebrew background. Not that the resources are not helpful, but many of the words on the English materials are Hebrew and this would be daunting for someone who was just learning it themselves. Don’t let that stop you from checking it out, though! Here is a link to Rabbi Hayman’s materials, the V’shinantam program (in Hebrew and English) and more: Bonayich Educational Services. Click here to download a sample of the V’shinantam program. A third vendor (in no particular order) was Rabbi Chaim B. Alevsky, of Tools for Torah. He’s the voice behind Tefillah Trax, which I consider the best davening CD out there at the moment and reviewed two years ago over here. You can preview the tunes at chabad.org over here, or click here to pay $10 and own the whole CD’s worth of music instantly. Rabbi Alevsky also offers Bentsching Trax, Tishrei Tunes (Rosh Hashanah and Yom Kippur) and a Pesach Hits CD. Rabbi Alevsky also had some of his own print materials available to buy at the conference, and others which were just sample copies. graciously sent me packing with a copy of his Kids’ Siddur for my suitcase. I really like the layout and style of this Hebrew/transliterated siddur. It seems ideally suited to parents working through it alongside their children, and having a teaching experience. Transliterations are given, but many pages also include vocabulary-builders (basic words like melech/king and neshama/soul) so you can grow in knowledge together. You’ll have to look through this siddur carefully to determine if it’s appropriate for you and your kids. The davening is Chabad-style, which is slightly different in a few ways from what most people are used to, but the siddur is available in both Ashkenazic and Sephardic transliterations. Click here for a free 28-page sample download. To be honest, having put so much energy into creating materials for home education, I’m a sucker for any stuff that looks like it’s been assembled thoughtfully, with an eye to making life easier for parents who may not have the strongest Jewish background. At one point, Robin Alberg, one of the speakers yesterday, asked who in the room was a baal teshuvah, and many, many hands went up. Here is a link to sample pages and more information about the siddur and Rabbi Alevsky’s other books and materials: ToolsforTorah.com. This is of course an incomplete list, and there were quite a few more vendors hanging out during the very long lunch break, hawking their programs. Which is great, because I feel like at this point, the more competition we have for excellent materials, the more our kids will benefit. I feel terrible leaving out Yael Resnick’s (co-founder, with her husband, Rabbi Yosef Resnick, of room613.org and founder of Natural Jewish Parenting) in-development conversational Hebrew program called Holistic Hebrew, “based on her unique, holistic approach to education.” It looks great, but having only been given a few minutes with the material, I don’t feel I can say much except that I’m excited to see how it turns out. I love the fact that the program has kids creating their own custom dictionary; as a parent of a kid who has to look up the same words over and over, every single time we use the Hebrew book, I think that would really help the knowledge “stick.” It also seems to build very gradually, based around a few new words per lesson, which are printed on special cards. One thing that’s special about her program is that it’s geared towards parents who don’t know Hebrew. While other vendors all said their materials were teaching-parent-friendly, I feel like, in most cases, they make assumptions based on the lowest common denominator of classroom teachers, not parents, where all materials should assume a very low comfort level with Hebrew. Of course, some homeschoolers may have a yeshiva-type background; hopefully, more and more will as homeschooling becomes more mainstream and less of a “crazy BT” thing to do. But the reality now seems to be that for most of us, things need to be spelled out pretty clearly to make sure we can share it competently with our children. Assumptions that professional kodesh educators make about what a person with “no Hebrew background” looks like are probably way beyond the capabilities of many teaching parents. (I thought about this when Rabbi Horowitz pulled up a list from chinuch.org of the most common shorashim in the Chumash and saw that in the find print at the top, a parent/teacher is directed to keep this list in mind when they are “chozer the chumash with your yingelah” (“review the Torah with your boy”, presumably meaning a student). Of course, this information wasn’t essential to understanding the list, but I speak from experience when I say that even just having scary words anywhere on the page is, well… scary. Hopefully, as BT parents become less afraid to home-educate their kids in limudei kodesh, materials will become more and more friendly to them, and teachers’ guides will become available that will help them wade through these sometimes slightly murky waters. These just popped up in an ad on a frum site: Binyan Blocks. It’s a cute idea, except that in a $65 set of 778 pieces, maybe about 30 of the pieces are special frum ones – ie the heads, hats and upper bodies of the minifigs (mentschies). I do like the fact that – in addition to the Large Shul - there’s an ambulance (Shomrim) and firetruck set. I love the idea that kids can grow up with the idea of Jews with hats and beards – Jews who look just like their dads! – as action heroes. It beats the pants of drawing kippahs on the regular Fisher-Price mentschies, which is what I used to do years ago. 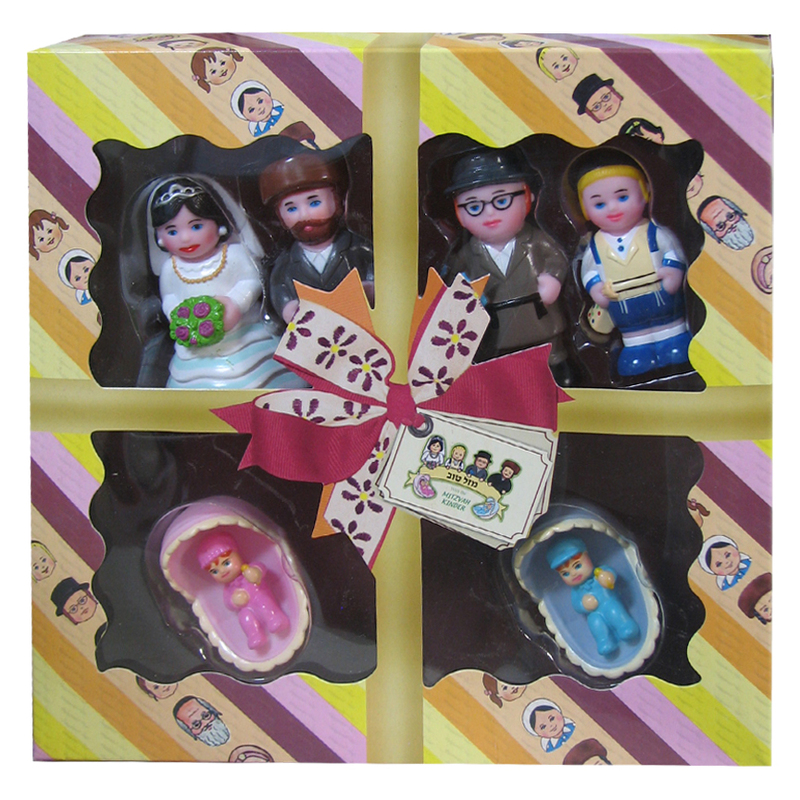 These seem to go hand-in-hand with another “picturing Jewish life” toy I’ve seen in stores here for a few years now: the Mitzvah Kinder. They’re more meant to go up against the Fisher-Price type dolls for younger children, I suppose, and again, I applaud the manufacturers’ idea to introduce a few of these who actually do manual labour, not just learning and going to shul. Not that there’s anything wrong with those things, of course. In general, I like the idea of dolls that mirror kids’ own lives, as long as they are not used to the exclusion of every other type of doll. One of Naomi’s favourite dolls was a beautiful, vanilla-scented Corolle baby doll that was Asian and very, very sweet. She also went through a long period of believing darker skinned dolls were more beautiful (and perhaps more exotic than our own Euro-Ashkenaz pasty pinkness). Male, white, brunet - chassidish, yeshivish, heimish (not sure what these distinctions mean and neither is anybody else, but they figure prominently in the makers’ description of themselves). Beard narrow, wider, full or too young to have a beard. Oh, yeah… and girls/women, white – brunette and more brunette. Actually, apart from the lapels, these look pretty much like any other minifig women… I mean, the hair always manages to look like a bad sheitel, right? In general, the Mitzvah Kinder do better for diversity. All ages are represented (not just “adult” and “old enough for a hat but too young for a beard”), every family includes mommies and girls, there are different hair colours, and many of the dolls are older people as well. That said, there’s still a Litvish / Chassidish split, where families can choose the dolls that look like them (just as, increasingly in Jewish books, there are different versions released so kids ONLY have to see pictures of people who look like themselves). A world of difference, right? Practically a whole rainbow! Yeah… a whole day. Sigh. Reminds me a bit of a page I created for our homemade siddur and then, thinking it might be useful to others, submitted to chinuch.org. They normally post my materials as-is, but in this case, they made two small changes. The one on the left is the page I made… the one on the right is the one they actually posted on their site, under my name. Can you spot the changes??? Yup, you got it. On the left, I purposely chose children who were actively involved in mitzvos in a slightly non-traditional way (just call me a troublemaker!). The boy is helping around the house, cooking and/or serving food, thus, presumably honouring his mother. The girl is lighting a menorah, in which she is indisputably obligated (though perhaps exempted if her father lights, and okay, yes, she is wearing short sleeves, which may be another reason she was edited out). The substituted images, on the right, are VERY traditional: the boy is wearing tzitzis, while the girl braids challah. Way to go for busting through those gender roles, frum world! Wow – sorry, a bit of a digression. I guess what I’m trying to say is that the toys we give our kids, like the learning materials we hand them, tells them a lot about themselves and their place in the world. Will we challenge them, by giving them a mixture of toys and materials that lead them to ask questions about how to accomplish their purpose, or will we just hold up a mirror to what they already know about us and our lives as ovdei Hashem (servants of Hashem)? Jewish toys are great if they have a place among the other mentschies and kitsch and clutter – sure, Hatzoloh trucks among the Matchbox racers; a shul set among the space-alien Legos… Why not? My only concern is for kids who don’t have the Matchbox cars, the space-alien Legos, the dark-skinned and Asian baby dolls, the toys that are not merely a reflection, but a window into the broader world. Which is still a lot to think about when you also might be reading this and thinking, “Cut it out; you’re over-analyzing. It’s just a toy.” Is it? So what’s your favourite Jewish toy??? And what messages is it giving your kids? So this is a whirlwind of impressions from the last whirlwind 5 days of travel… I just want to get some thoughts down before Life gets in the way. First of all, if you’re visiting this blog for the first time and met me at the conference… Hi! I apologize to everybody; I was operating at 40% of my normal energy level for most of the weekend, and I hope it didn’t show too badly. - Friday, erev Shabbos: Arrive late due to bus driver malfunction (he had to be hauled off in an ambulance). By the time we get to Baltimore, I am sick and miserable and exhausted with what is perhaps the worst headache of my life (partly due to caffeine deprivation but mainly not). Meet blog-world friend Michelle, who I’ve seen at the last 2 conferences. This year, she brought her daughter, Froggy (not her real name, though it would be cute), aged 7 (almost 8), and she and Naomi tentatively meet each other. By sundown, they’ll be getting along great, but on Friday afternoon, Naomi is mostly feeling her out in her weird and snooty way. She doesn’t enjoy new friends and would usually prefer to stick with grown-ups rather than make an effort. Luckily, Froggy recognizes Naomi Rivka for the child that she is and basically slaps a costume on her, forcing her to join in an all-sea creature puppet extravaganza. Yay for kids even bossier than my own (in a good way, of course)! - Meanwhile, our hosts’ kids are so utterly engaging that Naomi is hooked instantly, spellbound by their 12-year-old daughter and her wacky little brother (and perhaps also missing her own big sister and wacky little brother, just a little bit). With a big girl to teach her magic tricks and style her hair, she’s deep in her element. - Shabbos: so great! With ibuprofen, rest and a taste of chicken from supper, I am magically revived and by 10:30, we’re raring to go to the Oneg Shabbos at a local homeschool family’s home… an oneg Shabbos which began at 9. Turns out that was just a a serving suggestion, and 11 is a perfectly reasonable time to show up and, suddenly hungry, begin scarfing down the most delicious pareve popcorn I’ve ever tasted. Meet a few other mamas (nobody but us turned up with kids), then head back to our hosts’ home to sleep. - Shabbos day: more greatness. Feigning frumkeit, I go to shul, for a change (okay, I always try to when I’m a guest). The rav, Rabbi Menachem Goldberger, is plain-spoken and direct, and doesn’t seem to feel the need to a) start with a joke, and b) tie in psychological or political ideas into his drash on basic concepts from the weekly parsha. I often enjoy both these things at our own shul, but find this refreshing nonetheless. - Shabbos day, part 2: Nothing special or homeschooly about Shabbos davening, and we give the kiddush a miss, but in the afternoon, there’s a mass park “playdate” just down the street from our hosts where I finally – FINALLY! – meet up with one of my great homeschooling blog idols (mentresses? role models? ), Kerith from Learning Al Pi Darko. And her four kids! And her husband! They have driven two days to be here. Kerith is one of these people who automatically seems to assume that you are fantastic just because she is, and greets everybody with a smile. She awes and flabbergasts Naomi Rivka by immediately, there on the playground, picking her up and giving her a great big hug… and she is not a short lady. I have always sworn that this is who I can aspire to being in another life: with chicken coops and ducks and a goat and adopted children all running around, her life seems so much more expansive, giving and full of potential than almost anyone else I know. Oh, yeah, did I mention living frum in the heart of Georgia? If anybody could make it work, their family can and does. But wait! The fabulousness does not end there, because the insurmountable Yael Aldrich, our host for last year’s conference, also turns up at the playground, sans children (she must be the smartest of us all!) and only slightly jet-lagged from the trip over from Japan. Another hug, this one for me. It’s just really nice seeing familiar faces, new and old. And the niceness doesn’t end there! - Shabbos day, part 3: Shalosh seudos! At our hosts’ shul, where the rav stands up and gives a long talk about homeschooling, mainly about his changing attitudes towards it over the last 20 years. His talk is both apropos and brave at a time when rabbonim are still coming out and condemning homeschooling. He doesn’t give a blanket haskamah (approval), but offers a more nuanced approach in that he has come to realize that in some families, for some children, homeschooling is indeed the best option. His talk is thought-provoking and mature and, in my opinion, at least, it hits exactly the right note. Plus, the food is excellent. I told Naomi Rivka to expect egg salad, tuna salad, and “knot” bilkelach, and all three are present on the table, but there’s also a weird mix of root-vegetable and tortilla chips (I suspect it’s what my mother would call “Leftover Lovelies”), techina, salsa, and some other yummy savoury bits, along with a fruit plate and a chocolate roll that nearly rivals the chocolate roll I used to buy in Calgary for its generosity of chocolate (you need WAY more chocolate than dough, basically). By this time, Shabbos is over, so we head back for havdalah at our hosts’ home and after Naomi is in bed, I finish this crocheted sunhat I started on the bus. Not sure I like it, but at least, it’s done! - Sunday, the conference: Okay, I hate to leave you in suspense, but I’m going to put this part on hold until this evening so I can a) process my thoughts, b) eat lunch (yay, my appetite is back! ), and c) pay attention to my children. At the end of the day, I am embarrassed to realize that despite having unloaded several Marror Man books and a couple of bottles of maple syrup, I am STILL going to have to squeeze everything into my suitcase, and it is STILL not going to close all the way, which means I am bringing back way more than I went down with. It’s all the conference organizers’ fault – this year, they gave out really nice binders instead of just a one-page schedule and some loose-leaf pages. - Monday, home again! Moronic passengers at customs, as always, delay us by over an hour. For the first time in my experience, they actually detain one of the bus passengers. A driver told me a couple of years ago that the bus is not allowed to leave the border without a passenger unless they are officially detained. Bad news for the passenger who was detained, of course, but after an hour and a half and I-don’t-know-how-many-cigarettes smoked by the driver outside my bus window, it’s good news for the other hundred-some-odd passengers whose lives are on hold in the meantime. Back in Toronto, crawling through traffic, I point out familiar sights to Naomi, who asks me to please not “show her everything,” I tease her by saying I skipped mentioning two things I knew she’d have wanted to see. So she pesters me until I tell her the two things. Of course, I’d been joking, but I quickly find two sights that I haven’t pointed out and they are indeed the kind of thing she is happy to see. Ted drives downtown to pick us up, which is great because after another night of oxymoronic “rest stops,” my energy level is way down from the 40% I’d cranked it to for the weekend. Distribute aquarium gift-shop souvenirs, then open my special goodie bag of tacky Japanese kitsch items lovingly assembled by Yael Aldrich to find… a nori punch! The kids can have all the other stuff, but I, I am going to have winking sushi from now on. Well, maybe I’ll share it from now on. I love all this kitsch almost more than the official swag from the conference!!! But I will take pictures of all of it and post part 2 anon. It’s very funny that I have almost written more about coming home than about the conference itself. I hope nobody’s mad, having stuck with me through this whole post only to find nothing of substance. Am I the only one who finds this hilarious? Where we’re at with Hebrew (GZ’s new workbooks)!